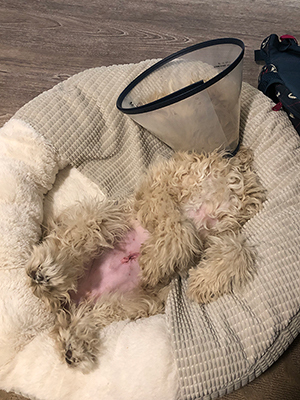 One of Preventive Vet's newest staff puppies, Mary Berry, just had her spay surgery done, and with it, came the Elizabethan collar that many of us humans refer to as the "Cone of Shame". While she was banging into walls and the backs of our legs, it brought up some questions for many of us in the office, so we figured it would be a great opportunity for Dr. J to give us the lowdown on all things E-collar, including how to use desensitization training to get your dog or cat used to it before they actually have to wear it. Sure, our dogs and cats look pitiful in their e-collars, and it's definitely not something that I would want to try wearing while eating and sleeping, but for our animals' post-surgical care, it's incredibly important to use these cones, or E-collars as directed. Why are Elizabethan collars important? The Elizabethan collar was made for the purpose of creating an incredibly effective barrier to prevent an animal from licking a wound or surgical opening. It's also great for problems like keeping paws away from eye injuries, or keeping mouths away from a hot spot. It keeps "problem area" clean, and dry, and prevents re-injury or further injury, and can be used in conjunction with other treatments, as a useful tool to help give the other therapies time to work. Did you know that some veterinarians use expired x-ray film to fashion E-collars for birds and other wildlife recovering from injuries or surgery? And if you search Pinterest, you'll find some really creative felt E-collar examples. This is not a picture of a bird in an Elizabethan collar. 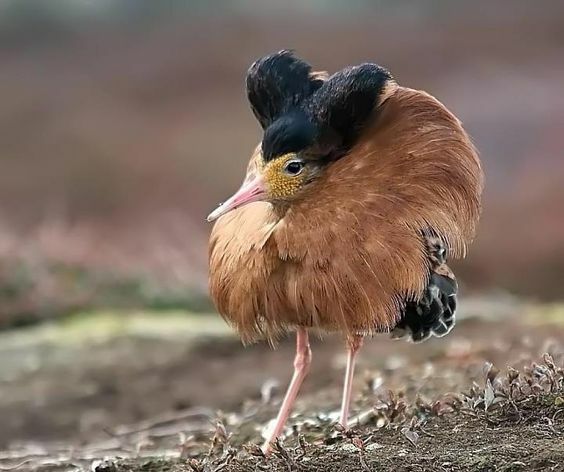 But this is the marvelous Ruff bird who is born with that beautiful plumage and, I'm guessing, if given the choice, would watch nonstop reruns of The Nanny, and want to set you up with a friend's nephew who is visiting from out of town. There are a lot of alternatives to E-collars, so why do veterinarians seem to prefer the hard collar? There's a lot of factors that really go into choosing the best recovery system. A lot of it depends on the size of the pet, what type of pet, the length of their muzzle, the procedure that was done, and where on their body it was. As an overall general rule though, the hard collar tends to be the most effective for a lot of the situations requiring you to use one. And really what veterinarians and the whole care team are doing is trying to prevent the pet from self traumatizing the area and either getting sutures out prematurely and causing the incisions to open up, which can have some actually very serious complications. This is especially true in the case of abdominal surgery, like a spay or a foreign body removal or a bloat surgery. Without protecting the surgical area, it's possible for animals to chew through their incisions and potentially have their organs come out. (Not a yummy thought, I apologize if you are reading or listening during a meal). There may be times when an inflatable collar, or a soft collar will work just fine, but thinking about keeping the end goal in mind, the hard collar will typically be the most effective option for accomplishing the goal of protecting the wound or a surgical site and minimizing complications. Those are legitimate concerns to discuss with your veterinarian because there might not be an alternative, but there might be some things you can do to adapt their environment to minimize those problems. But how are they supposed to eat and drink? And sleep!! Plenty of dogs and cats sleep, eat, and drink perfectly fine with those hard plastic E-collars on. Of course there are exceptions, especially when it comes to smaller dogs and cats. So for those dogs and cats, you might actually have to lift up their bowls and hand feed and bring them closer to their water. In some cases you can take the E-collar off, but with the caveat that you only do it if you are right there with your pet and you know that you can prevent them from licking or otherwise traumatizing their surgical site or their wound. And then you must commit to putting it right back on after they're done. You must be paying full attention, because again, if a complication happens, it can be devastating and costly. What about recovery suits, onesies, or button down shirts? Depending on the personality of the dog or the cat, and depending on the reason being used, recovery suits can work well, but definitely not in every situation. If we're mostly just looking to protect the incision from dirt or something like cat litter, then maybe putting a recovery suit on them — or even a onesie — either in conjunction with, or in lieu of, an E-collar or recovery collar, may be enough to prevent the area from getting dirty. So recovery suits can definitely have their place. And certainly if a dog or cat is not overly inclined to be chewing and licking the area, then maybe it's just a recovery suit that they need because we aren't having to worry about their mouth getting back there as much. But again, this is something to discuss with your vet in conjunction with knowing your pet's personality. Training your dog or cat to be desensitized to an E-collar before needing to use one can really be worth your time and the methods are basically the same, and has plenty of other practical applications. Really, the goal is just introducing the thing that you want them to be comfortable with, and make it a positive experience so it's not a battle. You bring the collar into their environment and you them a treat when they interact with it, like when they touch it with their nose. And when you reach the point of putting the collar on, you praise them, and you give them treats. So in their mind, when the E-collars is on, their world is awesome and definitely not torture. They're making the association in their mind that the collar, although it might be weird and inconvenient, and might obstruct their peripheral vision or throw them off balance, it's still awesome because it means treats. Here's a video of me trying to desensitize my cat, Mazel, to an E-collar. Considering his incredibly smushed (and adorable) face, he did pretty well! Desensitization training is really great for when your animal is having an elective surgery and gives you plenty of time to prep. When you first get a puppy or kitten you know that in anywhere from 4 to 10 months, they're probably going to have a spay or neuter procedure. So when they're a puppy or a kitten, that's a great time to start introducing them to an E-collar and acclimating them to it so when the time comes, it's second nature and they know it's going to be ok.
What are some of the problematic things vets see people doing while their dog or cat is supposed to be using an E-collar? The biggest one is taking the cone off and not heeding the advice and recommendations of the veterinarian for post-operative care or wound care. People not using the cone at all is another big problem, because it's vitally important for your animals to use it for their own protection. Veterinarians send these supplies home with you, not because they are revenue centers — it's not like there's huge markup on E-collars — but because they are trying to minimize postoperative complications and minimize the likelihood that you will need to wind up back in their office or the emergency room treating something that could have been prevented with proper use of that recovery system. So the biggest thing is don't take it off. Don't alter the plan without first talking to your veterinarian. If for some reason your veterinarian isn't sending you home with an E-collar after surgery (like Mazel's neuter procedure) ask them if they feel it's necessary for your dog or cat to have a collar, or anything else to help keep them away from the area. Another huge issue that people do a ton is actually cutting the collar so it doesn't extend as far beyond your pets nose as it was when it was sent home. And sometimes that can be done in guidance with your vet because, well, there's only certain sizes of E-collars and so sometimes they even need to cut them down at the hospital. But if you cut it down to the point where it's shorter than your pet's nose just to try and make it easier for them to eat, drink, or sleep, you're oftentimes defeating the purpose of the cone and making it easier for them to nibble out their sutures or self-traumatize the wound. If your dog or cat is walking around bumping into everything, maybe you can find a better setup that won't include as many obstacles to knock over. And if you have a cat in a recovery collar, make sure they are able to use their litter box without any issues. The last thing you want is a cat who isn't able to use their litter box! Here is some specific advice for how to take care of your cat after surgery. Not a fan of the plain hard collar? Jazz it up with some creativity! 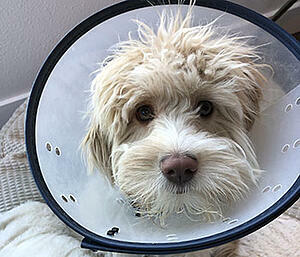 Check out some of the entries for Trupanion's "How to Create a Cone of Joy" contest. My favorite, the game show spinning wheel, is front and center. 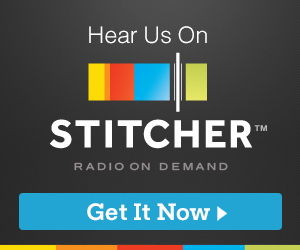 Thanks again for reading and listening. Have a story to share with us? We'd love to hear from you!